Click (or tap) the icon of a report whose name begins with "Interactive" and ends with "Report Builder" (to create a report from scratch). Or, click (or tap) a saved report (for only you or for all users) that was based on an interactive report builder. The interactive report builder appears. Click (or tap) the Toggle Edit link. The interactive report builder options for that report appear. Data tab - Depending on the type of interactive report (for example, schedule), the items (data fields) that appear on the Data tab may vary. The data fields in the list correspond to information in your organization's database. The data fields are grouped by category. Note:The information for each data field in the list is updated automatically from data in your organization's database every 15 minutes. Filters box - The Filters box displays filters you have set up. From this box you can edit and remove filters. Toolbar - You can perform various tasks, such as controlling the layout of the page and exporting the report, from the toolbar. 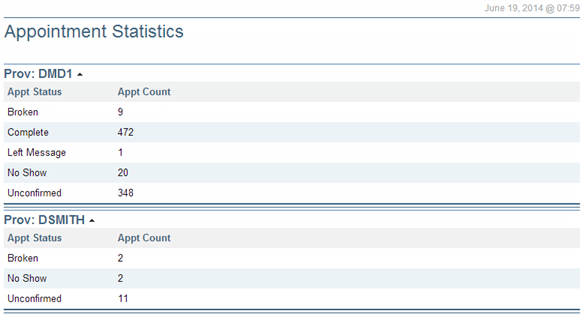 View area - The report appears in the View area according to the layout and filter options for the selected data fields. 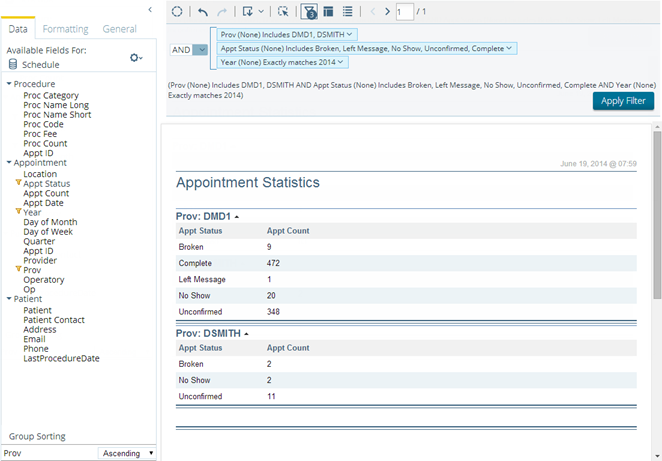 Example: A custom report that displays the number of appointments with each of the specified statuses within the specified year. Also, the report is grouped by provider. Double-click (or double-tap) the current report name ("Untitled" by default), and then enter a name for the report. To create the layout of the report, drag data fields from the Data tab to the View area. To create a column, double-click a data field, or drag a data field to the viewing area. Release the mouse button when the vertical guide appears in the desired location. 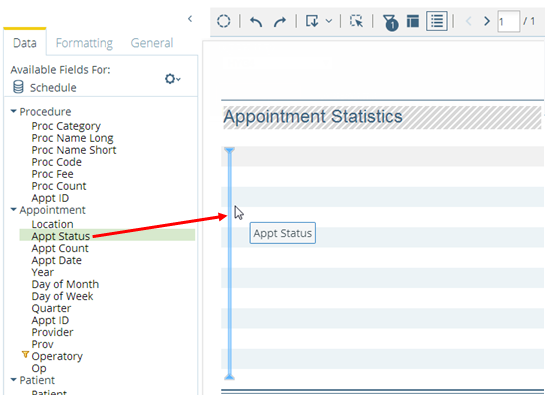 Tip: To add a column to the right of an existing column, drag a data field to the right side of the viewing area. To group the columns on the report, drag a data field to the area directly above the column headers in the viewing area. Filter the report, and perform other tasks as needed. 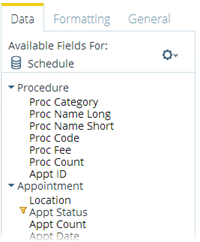 Drag a data field (does not have to be part of the layout already) from the Data tab to the Filters box. On the menu for a data field that is part of the layout already, click (or tap) Filter. Select from a list - Select items in the left list box and then click (or tap) the Add Selected button to add them to the right list box. To add all items at once, click (or tap) the Add All button. Select Included or Excluded from the Currently list (above the right list box) to specify that the items in the right list box will be included or excluded from the report. Specify a condition - Specify the condition that has to be met (for example, equals 3, on 2014-11-11, or exactly matches "Brent"). Click (or tap) OK to apply the filter. Drag a data field (does not have to be part of the layout already) from the Data tab to the Prompts box. On the menu for a data field that is part of the layout already, click (or tap) Prompt. Make a selection from the list that appears. Undo / redo changes - To undo any layout and filter changes, click (or tap) the Undo button . To redo any changes that were undone previously, click (or tap) the Redo button . Filters button (if there are filters being applied to the report, the button has a number on it ). To export the report to save or print it, from the Export button menu, click (or tap) the desired output file format (for example, PDF). 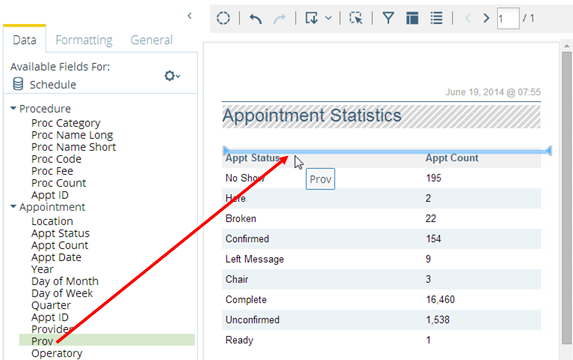 How do I create a custom report for the Number of Scheduled Appointments?